Besides above, we have already provided Free Parking for personal cars at our new Parking Lot, south of the State Road D-409, with total capacity of 900 personal car places. We kindly ask personal car drives who need to park their vehicles for any reason whatsoever to use the new Free Parking Lot. The Pedestrian Zone leading to traffic lights crossroad, and further to the Passenger Terminal is provided. 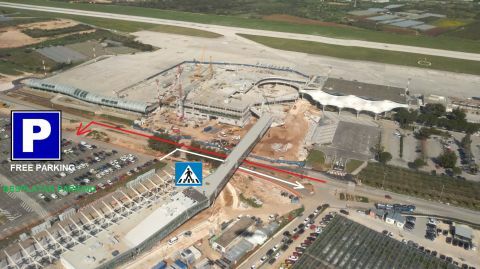 We started works on marking the space for passenger handling in front of Passenger Terminal (Parking Lot). 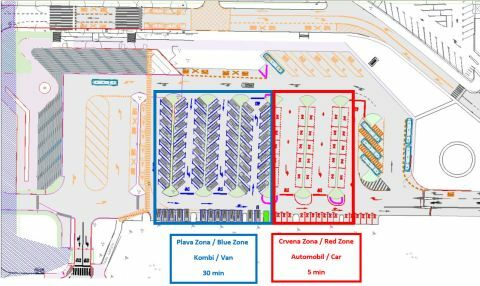 Therefore, we kindly ask all users coming to the Airport by car to use the NEW FREE PARKING LOT marked on the photograph. Summer season 2018 flight schedule can be seen here. On 21st March 2018, the demonstration exercise named “Flaps 2018” was held, with aim to test preparedness of all intervention services in the case of airport aircraft accident. According to the scenario, the cause of aircraft accident was defect of hydraulic system of aircraft arriving to Split Airport. Air Traffic Control was reported about defect of hydraulic system of A319. The captain expressed doubt regarding malfunction of flaps and safe landing of aircraft. Air traffic controller announced total emergency alert and informed airport services about possible emergency situation. After that, all activities in accordance with Proscribed Emergency procedures were started. 3. Information flow and response of the invited. Split Airport would like to thank all participants for successful and efficient reactions and coordination shown during the exercise. Split Airport informs residents of Split, Kastela and Trogir that regular Airport Emergency Exercise will be held on 21th March 2018, from 16:00 to 17:30 hours. A large number of outside Fire and Rescue Forces and Emergency Service Units from Kastela, Trogir and Split participate in the exercise. Therefore, many vehicles with lights and sirens will move towards the Airport. In the immediate surroundings of the Airport sound alarms may be heard and smoke clouds may be observed during the exercise. We kindly ask residents not to get disturbed, because it is related to the exercise aimed at testing the response preparedness of all emergency intervention services.